The outbreak of Ebola haemorrhagic fever has been unprecedented in scale. Over 151 cases and 95 deaths have been reported from Guinea alone. In this humanitarian crisis, the need for information is crucial not only to plan operations, but to coordinate with partners and educate the general public. 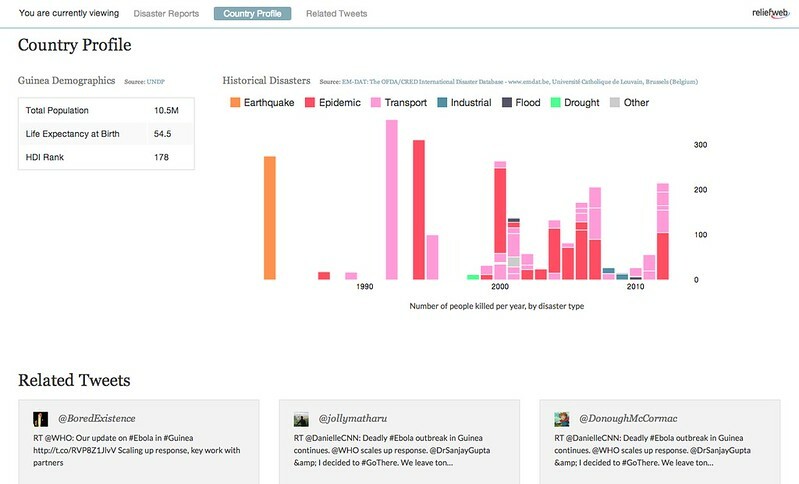 This afternoon, we’re launching with ReliefWeb an application that pulls vetted reports and analysis, and combines this with filtered Twitter and historical disaster data to create a usable disaster-tracking dashboard. It utilizes the Reliefweb API that we deployed in partnership with Phase2. The ReliefWeb Disaster Tracker is a simple prototype that shows how open data can help improve understanding of a disaster. The early hours of any crises are critical times for preparedness and humanitarian response, and having access to information is crucial. We built this application so that it can be quickly rolled out by an independent developer during the early moments of a disaster. The application is also open source, and we want to encourage developers to use it and improve it. There is a lot of useful data out there that can help disaster responders, policymakers, and media to understand a crises, but it’s time-consuming to find them all. Data becomes more useful when it’s in context. 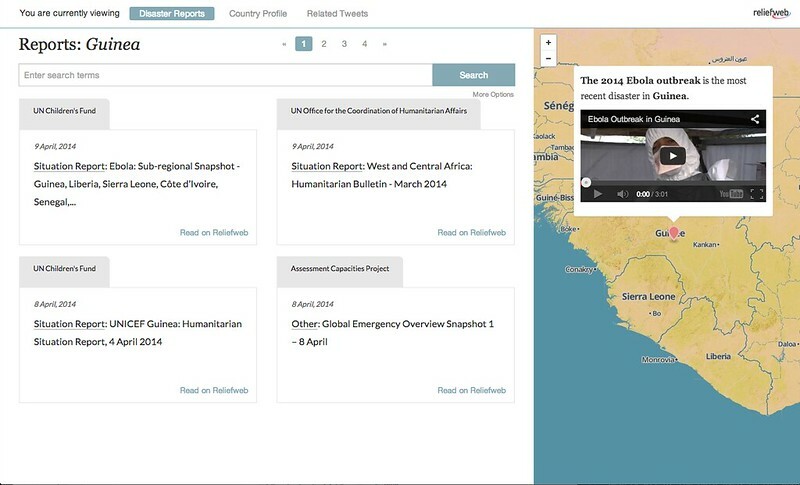 Alongside ReliefWeb reports and updates, we’ve baked in external data from Twitter, EM-DAT (the OFDA/CRED database of disasters), and UNDP’s Human Development Index to give a snapshot of a country’s situation. 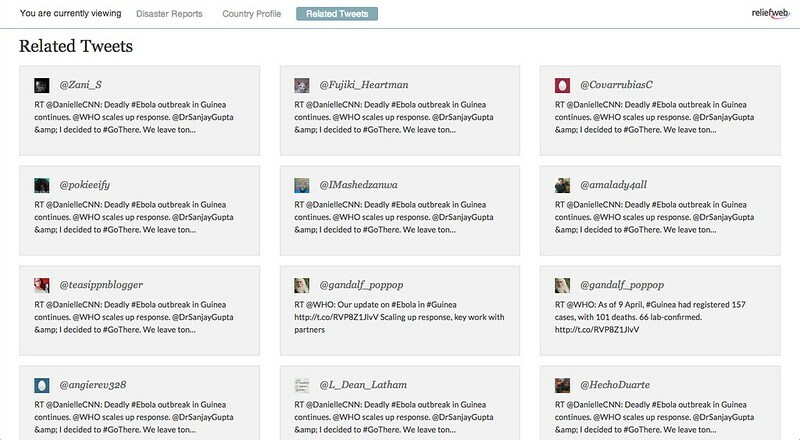 Filtered data from Twitter enables a quick view of information coming from the organizations working on the ground to respond. To pull data from Twitter, we deployed our Twitter Server codebase, which runs continually on a small cloud server. Nearly all of the data used in the application is open and accessible through public API’s. Demographic data is made available through UNDP’s Human Development Index API, Twitter data is made available through their REST API, and the ReliefWeb reports are made available through their new API. Data from EM-DAT is not completely open and does not have a method for programmatically integrating the data.